MPHL-150 automatically labels round container of glass, plastic, aluminum, pet, cardboard container, will wrap-around labels in the vertical position by using cold glue. MPHL-150 is rigid, versatile and engineered for reliability and enhance operational efficiency in addition, it has several exclusive features which offer additional advantages. The round containers positioned accurately by the feed worm for wrap-around operation at the labeling point, the rotating glue cylinder receives cold glue from gluepot that subsequently gets transferred on the Glue Rubber Roller. Finally a fine, even and thin film of glue is transferred to the gluing pad. The round container on the moving conveyor at the feed worm actuates a sequence, which result in the oscillation of the Label Box. 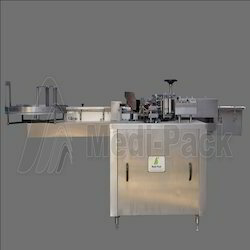 The rotating Label Master aligned with the help of pick up fingers from the Label Master & with oscillating Label Box. The pick up cylinder receives labels with the help of pick up fingers from the label master. The pick up cylinder holds the labels perfectly with due to vacuum during its rotational movement. Simultaneously the pick-up fingers move inside. The round container moves on conveyor with the help of worm and glued label on pick-up cylinder wrapped around to container by virtue of strip belts. Then the labeled container moves further through a rubber pressing belt & stationary rubber pad that ensures neat & perfect fixing of label. Capacity Output/Hour 3600 to 9000 Nos. Description : MPHL-150 automatically labels round container of glass, plastic, aluminum, pet, cardboard container, will wrap-around labels in the vertical position by using cold glue. MPHL-150 is rigid, versatile and engineered for reliability and enhance operational efficiency in addition, it has several exclusive features which offer additional advantages. Operation : The round containers positioned accurately by the feed worm for wrap-around operation at the labeling point, the rotating glue cylinder receives cold glue from gluepot that subsequently gets transferred on the Glue Rubber Roller. Finally a fine, even and thin film of glue is transferred to the gluing pad. The round container on the moving conveyor at the feed worm actuates a sequence, which result in the oscillation of the Label Box. 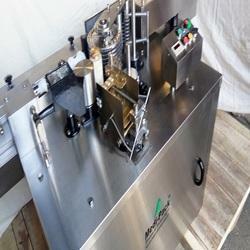 The rotating Label Master aligned with the help of pick up fingers from the Label Master & with oscillating Label Box. The pick up cylinder receives labels with the help of pick up fingers from the label master. The pick up cylinder holds the labels perfectly with due to vacuum during its rotational movement. Simultaneously the pick-up fingers move inside. The round container moves on conveyor with the help of worm and glued label on pick-up cylinder wrapped around to container by virtue of strip belts. Then the labeled container moves further through a rubber pressing belt & stationary rubber pad that ensures neat & perfect fixing of label. High speed Automatic Glue Labeling Machine offered features latest technology support and finds use in meeting the labeling requirements of beer, wine and others. Further, these bottles can be of different finish types like glass bottles, PVC/pet bottles and others. 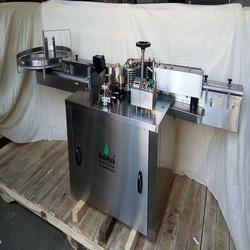 Some of the features include easy to operate functionality support, stainless steel material finish for hygienic handling of the process, can handle different diameter bottles like from 30 to 120mm and bottle heights of 55 to 360mm; can handle label height up to 100mm and label length up to 200mm. The round containers positioned accurately by the feed worm for wrap-around operation at the labeling point, the rotating glue cylinder receives cold glue from gluepot that subsequently gets transferred on the Glue Rubber Roller. Finally a fine, even and thin film of glue is transferred to the gluing pad. The round container on the moving conveyor at the feed worm actuates a sequence, which result in the oscillation of the Label Box. The rotating Label Master aligned with the help of pick up fingers from the Label Master with oscillating Label Box. The pick up cylinder receives labels with the help of pick up fingers from the label master. The pick up cylinder holds the labels perfectly with due to vacuum during its rotational movement. Simultaneously the pick-up fingers move inside. The round container moves on conveyor with the help of worm and glued label on pick-up cylinder wrapped around to container by virtue of strip belts. Then the labeled container moves further through a rubber pressing belt stationary rubber pad that ensures neat perfect fixing of label.